When priests visit our parish to celebrate Holy Mass on Sunday, they often make the remark that things seem to all fall into place easily and practically effortlessly. I thank them for their kind remarks but in the secret of my heart I offer a prayer of thanksgiving for the countless volunteers who make so many great things possible here at St. Joseph. Without those dedicated members of our community that serve in various ministries we would not be able to do so much. As another school year winds up and we get ready for the summer season I would like to express my appreciation to all who give of their time and talents in our community. Many are discrete and humble workers in the vineyard of the Lord and their service goes unseen but not unappreciated - to those in particular I wish to say a heartfelt thank you. As I complete a third year as Pastor of St. Joseph Parish I continue to be amazed at your generosity and dedication. I pray that the example of so many who serve in our community may inspire others to share their time and talent and thus enrich our Parish Community. To all a pleasant, restful summer! 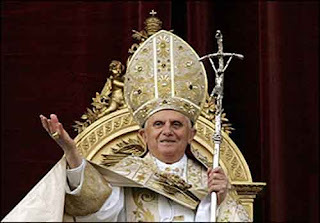 O God, Shepherd and Ruler of all Thy faithful people, look mercifully upon Thy servant Pope Benedict XVI, whom Thou hast chosen as shepherd to preside over Thy Church. Grant him, we beseech Thee, that by his word and example, he may edify those over whom he hath charge, so that together with the flock committed to him, may he attain everlasting life. Through Christ our Lord. Amen. What the New English Translation of the Mass be like? A new translation of the Mass has just been approved by Rome. This will affect all worshippers who must now get adjusted to new translations, new responses and in certain cases new ways of doing things. When the new missal is ready it will be introduced to us. In the Mass there are certain parts, which are always the same. Called the Ordinary of the Mass, it contains the Kyrie, the Gloria, and the Sanctus. There are also responses where the priest says something to us and we respond back. There are also proper prayers that vary from Sunday to Sunday. The first thing we will have to learn are new responses. For example, when the priest says, “The Lord be with you” we will respond “And with your spirit” instead of “And also with you.” It might be a little awkward at first, but if we pay attention these new passages will become familiar to us. Some critics of the new translation are afraid that the vocabulary used is outdated or difficult to understand. As one Cardinal remarked however, we should not be using the same level of language, the same vocabulary to address the All Powerful God as we do for a Barbecue! Some words and expressions apply themselves to our liturgy others are for more casual moments of our life. We already use some words in liturgy that we would never use elsewhere. Think of the Our Father! As Catholics we have a rich tradition which we need to rediscover and to use. The New Translation will also be a unique opportunity to rediscover part of our musical tradition. The Bishops who worked on this new translation envisioned that we would be making more common use of chant, which is part of our rich heritage. They invite us to rediscover Gregorian chant whether the words be in Latin (the official language of Church and of its liturgy) or in English as the best suited “musical genre” for liturgy. In the weeks and months to come will we have to prepare ourselves for some change and together deepen our understanding of what we do together when we celebrate Eucharist. May this unique journey leads us closer to God the Father through the intercession of His Son, who is the Living Bread come down from heaven.